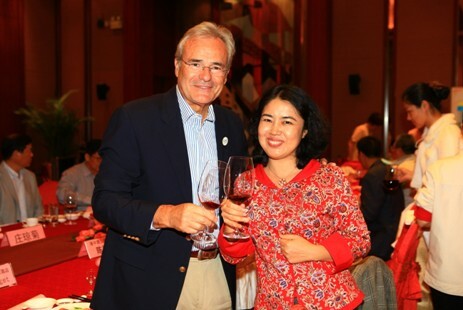 At the first meeting of Sanya Tourism Association, and New Year Reunion of 2011, Mr. Michel. Goget, General Manager of The Ritz-Carlton, Sanya was selected as Chairman of Sanya Tourism Association and "Outstanding Entrepreneur" of Sanya by representatives from Sanya. City Government and Tourism Companies, Mr. Li Bo Qing, Vice-Mayor of Sanya City, Ms. Du Li Yin, Chief Director of Sanya Tourism Bureau have issued certificate of appointment and award trophy on behalf of Sanya City Government. Mr. Michel Goget is a hospitality professional who has acquired a wealth of management in seven countries over the past two decades. Under his leadership, The Ritz-Carlton, Sanya keeps up with its No.1 position in Hainan Island since the third month of opening in terms of Average Rate, Occupancy and REVPAR. The hotel also had won over 50 awards from within the tourism industry since opening in 2008, including "2010 Top Leaders of the Hotel Industry" in The 7th China Golden Pillow Ceremony. Sanya Tourism Association represents and maintains community of interest, maintains lawful rights and interests of members, plays a role of bridge & bond among member, service and government, especially for continued, stable & healthy development of Sanya Tourism and its internationalization. As of the end of 2010, a total of 180 members joined in Sanya Tourism Association, including hotels, travel agencies, scenic spots and special tour operators. Situated on an exclusive site along Yalong Bay in Hainan Province, The Ritz-Carlton, Sanya provides luxurious views of the South China Sea and features 450 guest rooms, suites and private villas. Extensive recreational facilities include swimming pools, tennis courts, fitness centre and the signature Ritz Kids® Club. Guests will also enjoy the largest Ritz-Carlton spa in the region designed by ESPA. Eight restaurants and lounges offer scenic views of the lagoon and the ocean. In addition to flexible space designed for meetings, conferences and special social events, and a wedding chapel. As the Sanya’s only waterfront wedding chapel, it has been the backdrop for many intimate ceremonies. A designer on-site boutique shopping arcade with five of the world’s top brands: Louis Vuitton, Salvatore Feragamo, TOD’S, Paul & Shark and Ermenegildo Zegna is a first for Hainan Island. The Ritz-Carlton Hotel Company, L.L.C., of Chevy Chase, Md., currently operates 73 hotels in the Americas, Europe, Asia, the Middle East, Africa, and the Caribbean. More than 30 hotel and residential projects are under development around the globe with future openings including Dubai International Financial Centre, United Arab Emirates; Toronto; and Hong Kong. The Ritz-Carlton is the only service company to have twice earned the prestigious Malcolm Baldrige National Quality Award, which recognizes outstanding customer service.